The 2005 Lake Tanganyika earthquake occurred at 14:19:56 local time on 5 December with a moment magnitude of 6.8 and a maximum Mercalli intensity of X (Extreme). 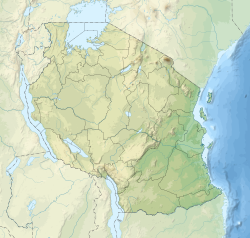 The shock occurred along the East African Rift, an active continental rift zone in East Africa that is characterized by normal faulting, and initiated at a depth of 22 kilometers (14 mi). Early reports indicated that the heaviest damage was sustained by the eastern provinces of the Democratic Republic of the Congo (DRC), a region already ravaged by extensive war and extreme poverty. The area houses tens of thousands of refugees displaced by conflicts, such as the Second Congo War and the Burundian Civil War, that have plagued the African Great Lakes in the 1990s and 2000s. Dozens of houses collapsed in the DRC city of Kalemie. A UN spokesman said that most of the casualties were caused by falling zinc or steel roofs. Depending on several factors including soil types, prevalent construction techniques and the acceleration from the earthquake itself, earthquakes with magnitudes in the 6–7 range may or may not cause wide spread damage. In East Africa such seismic events can wreak havoc. The quake was centred roughly below Lake Tanganyika and – in addition to the DRC, where the most widespread damage has been reported – it was felt in Burundi, Tanzania, Rwanda, and as far away as Mombasa, Kenya, and Luanda, Angola. ^ a b "Powerful quake rocks East Africa". BBC News. 6 December 2005. Archived from the original on 10 December 2005. Retrieved 6 December 2005. ^ "East Africa quake buries children". CNN. Archived from the original (link expired) on 8 December 2005. ^ "Magnitude 6.8 quake kills at least two in Congo". MSNBC. 5 December 2005. Archived from the original on 7 December 2005. Retrieved 5 December 2005. This page was last edited on 7 March 2019, at 09:08 (UTC).